I hope everyone is enjoying there Easter holiday with family and friends I hope to enjoy an Easter dinner here shortly myself. 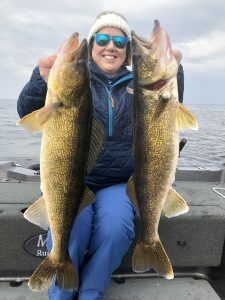 As we move through the month of April and we are receiving warmer weather we are also seeing water temps getting warmer and in many locations we are now seeing many walleyes that are or have already spawned. As we move into a post spawn time frame we will begin to see the walleyes spreading out from the areas that they have recently spawned in and begin to feed up to regain some lost energy from spawning. During this time you will begin to find fish in shallow water along with some fish on the move moving to areas further away from where they have recently spent some time.During this time when trying to locate walleyes keep an open mind and don’t spend time in areas not catching fish where you recently have been catching fish and begin to broaden your range as to where you are fishing. Now is the time to look for walleyes that are using different areas on there way away from spawning grounds. As I write this fishing report the Midwest is undergoing a spring super storm that is dumping record amounts of snow and very high winds. This weather will be out of here and better weather is on its way back and we will be back on the water chasing trophy pre spawn walleyes. We have been finding success catching walleye over the past week targeting shallow water looking for schools of walleyes that have been relating to areas that will be close to where they will want to spawn. Our presentations have been casting lipless crankbaits along with jigs and soft plastics. The shallow water fishing for walleyes will continue to provide great fishing opportunities for over the next month and we will be fishing for them on a daily basis. 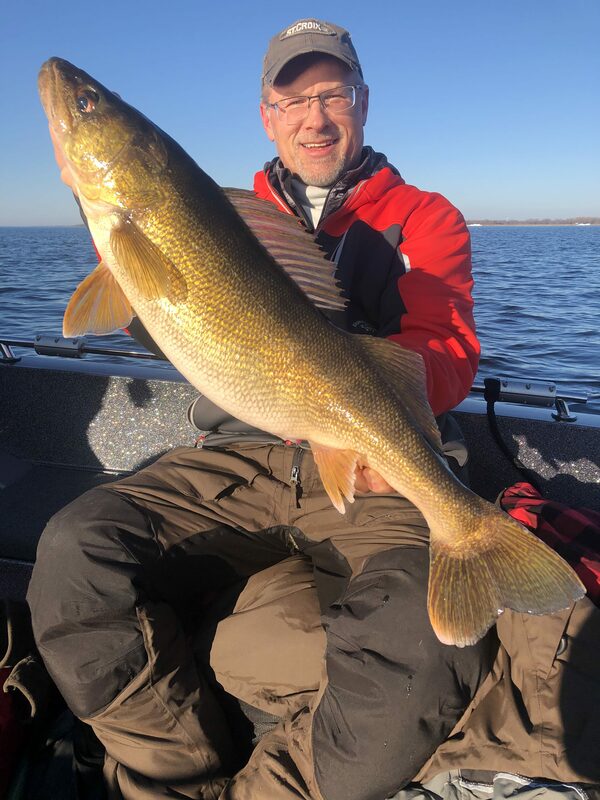 well the open water fishing for the 2019 season is underway and even though we still have a lot of ice on the Bay there is fish able water that is providing us with great fishing opportunities and we are catching many quality walleyes each day and we are getting more open water on the bay every day. We have been catching great walleyes every day using casting techniques with many different baits working for us but it has been a very slow presentation that has worked best for us due to the clod water temps which has had the fish in a very lethargic mood. 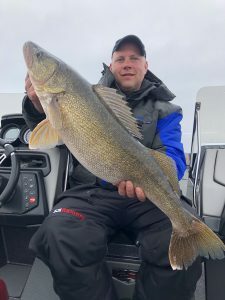 The walleye fishing is only going to get better and better over the next several weeks with great opportunities at catching some very quality size walleyes. Well here we are in the beginning of March and we are still dealing with single digit temperatures and after a very brutal winter season with extreme cold temperatures along with tremendous amounts of snow it would sure be nice to see things begin to go the other way. 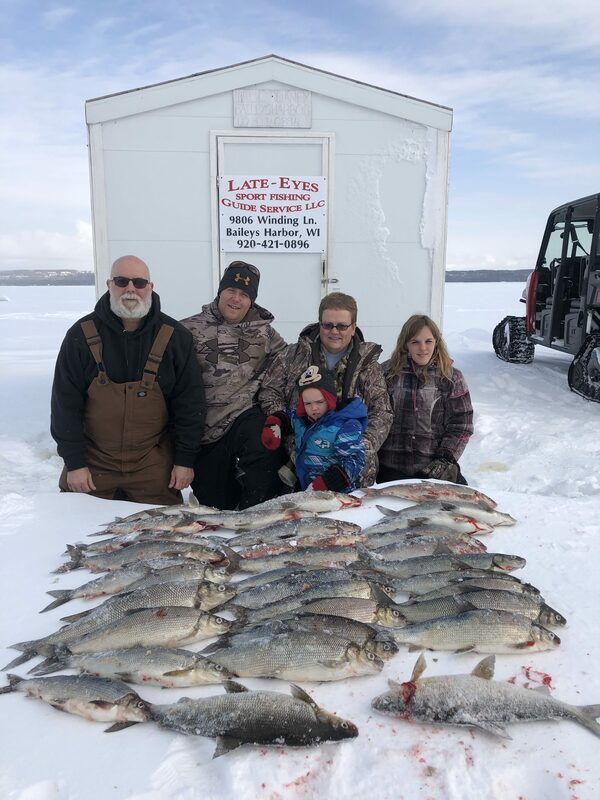 As far as the ice fishing goes we have still been catching good numbers of Whitefish daily with some days being better than others but overall pretty good fishing. We will still be continuing to fish for whitefish for the next couple of weeks but we will also begin to start fishing for Walleyes and Northern Pike more often moving through the month of March. The late ice period can an will begin to produce better catches of game fish such as walleyes and pike and this is actually my favorite part of the ice season because you have a great opportunity at catching that tropy fish of a lifetime.